You want to create an eye-catching flyer that connects with potential customers. But in the season of love, you have to work even harder to cut through all the sales, events and feel-good ads. 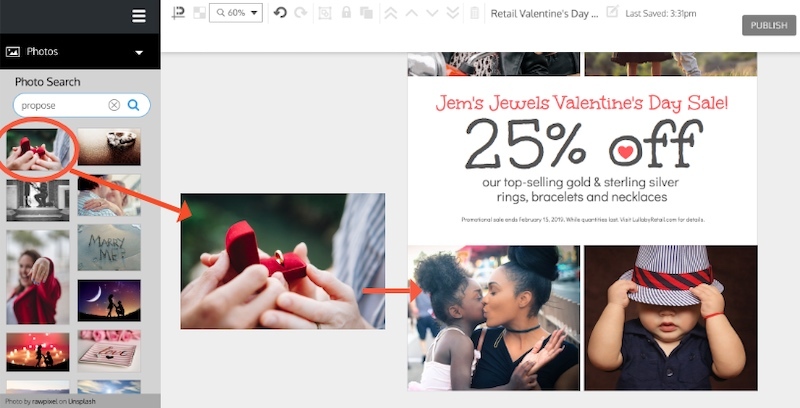 One strategy is to break away from tired themes and visuals—think hearts and cupids. Differentiate your design and stand out from the competition. 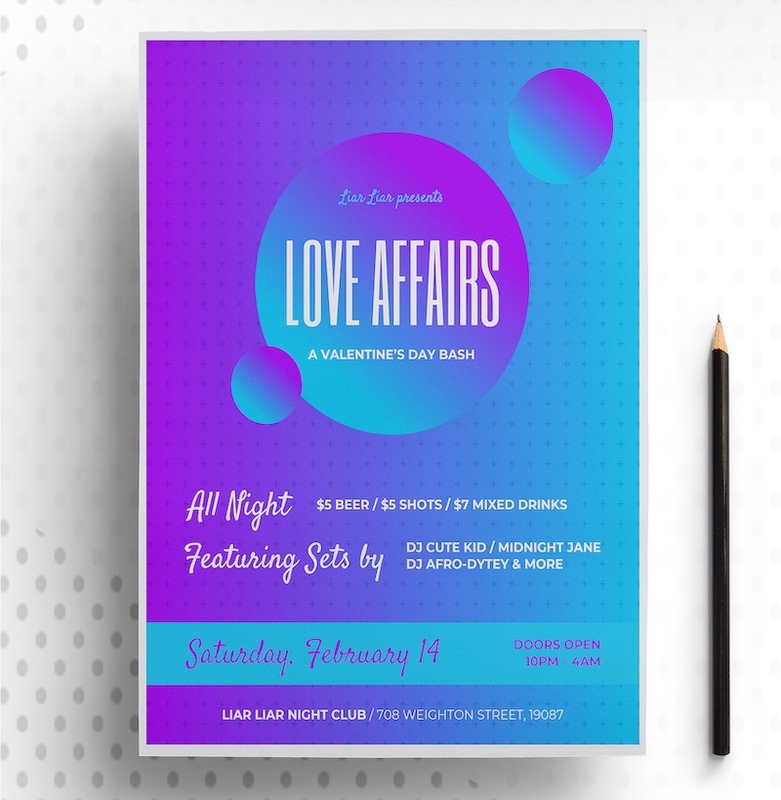 Our top 10 Valentine’s Day flyer templates still say “day of love,” but in a distinctly modern and fresh way. 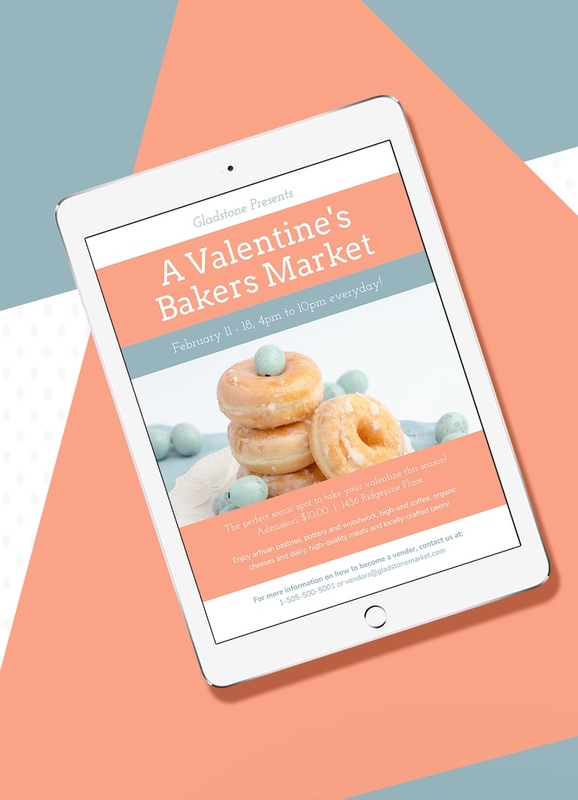 Whether you’re trying to promote a Valentine’s party, sale, fundraiser, conference or local event, we’ve got a template that will grab your customers’ attention. Plus, all of our templates are fully customizable. Edit the text, change the color, add images and more to make our designs uniquely your own. 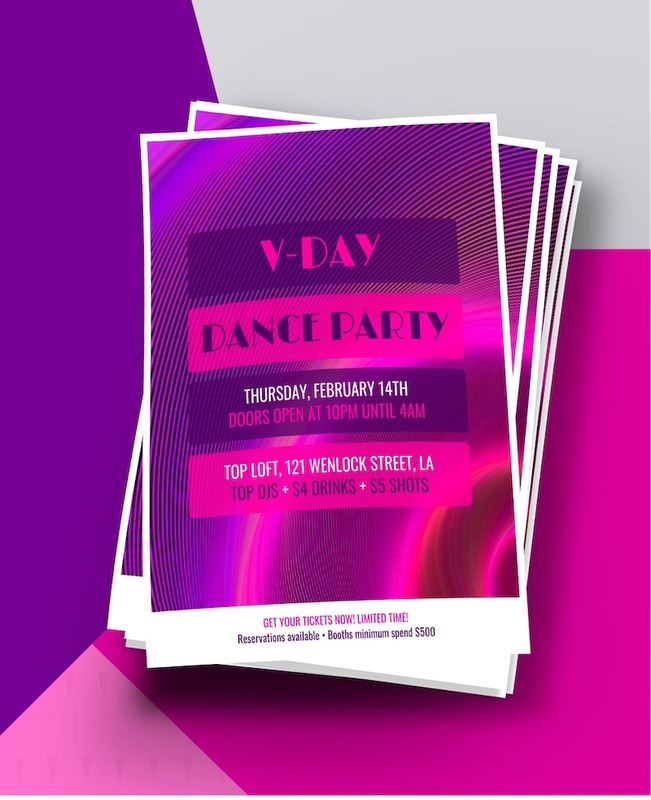 You can find even more Valentine’s Day flyer ideas on our flyer templates page. 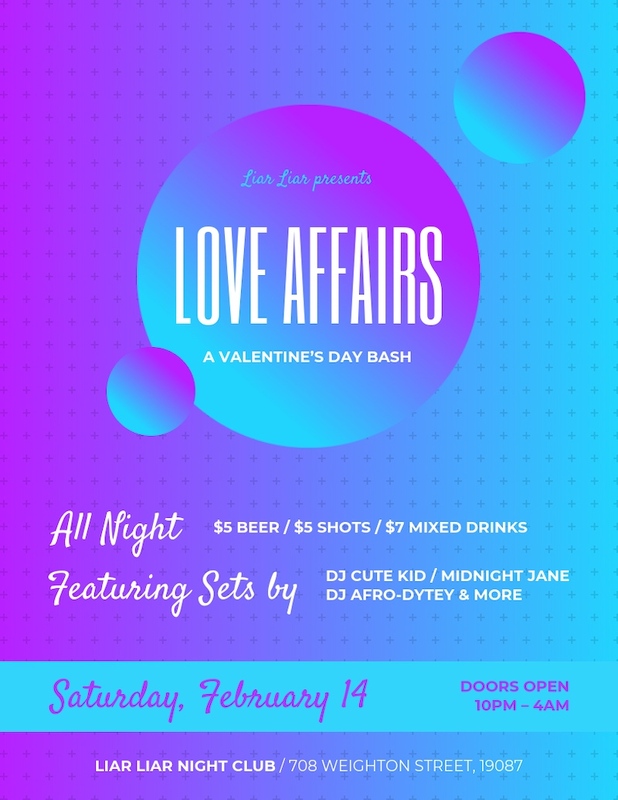 Scroll down and pick the Valentine’s Day flyer template you like. Click the green button below the flyer image to get started. You’ll enter our online flyer maker tool. Click the text boxes to edit the details. Click “Image Upload” to add your logo or photos. Click “Share” to email your Valentine’s Day flyer or post it to Facebook, Pinterest, Twitter or LinkedIn. To print your Valentine’s Day flyer, click “Download.” Select one of our high-resolution options: PNG HD or PDF. Jump to our section below for further instructions. 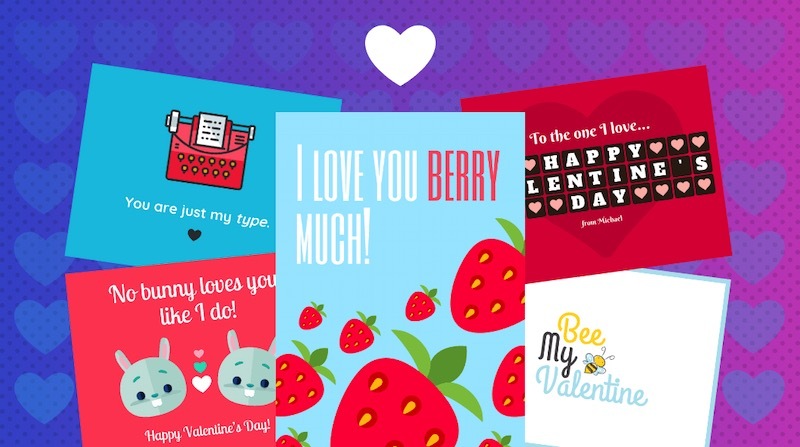 Alternatively, you can use these flyers as part of your Valentine’s Day email marketing strategy. Forget expensive prix fixe dinners and overpriced long-stem roses. Your customers prefer to spend the day of love partying hard. 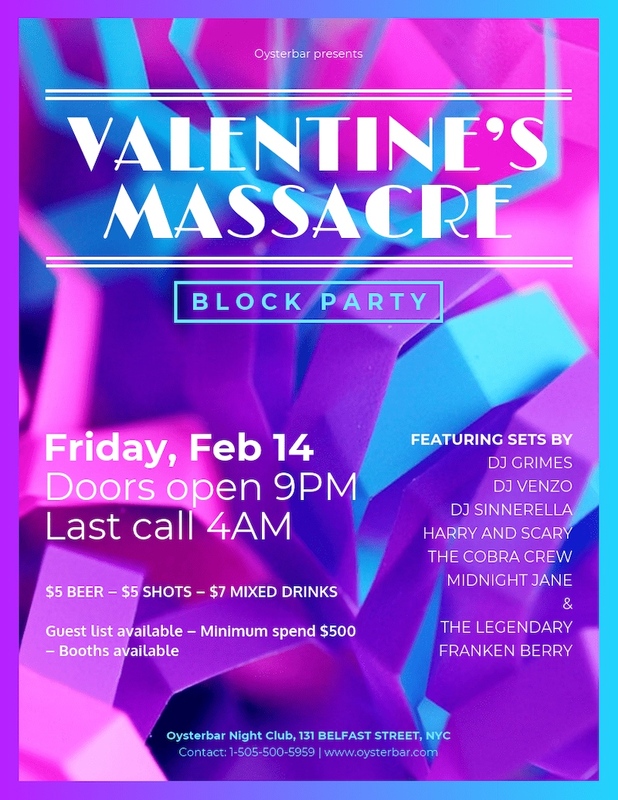 Grab their attention with this effortlessly cool Valentine’s Day flyer. Text takes the main stage in this design so you can easily communicate key details. Don’t forget a call to action (CTA): what you want your customers to do and where to do it. For example, where to buy tickets. This information should go at the bottom of the flyer. Don’t forget your contact information! Include a phone number or other way to reach you. If your customers have questions, they need a quick and easy way to find answers. Otherwise, you’ll miss out on sales. 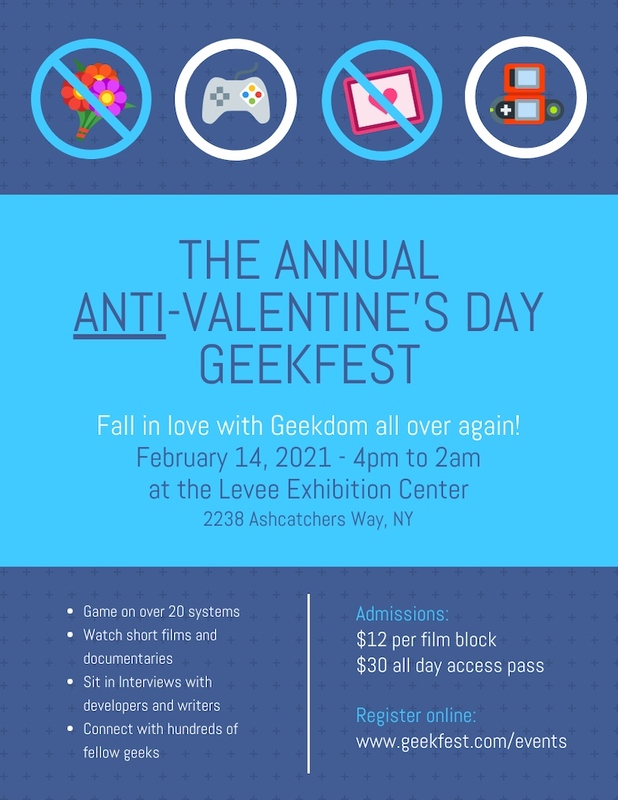 Promote your geek-tastic Valentine’s event with this modern flyer template. It has plenty of text boxes to slot in your event details, list its selling points and include a CTA (call to action). 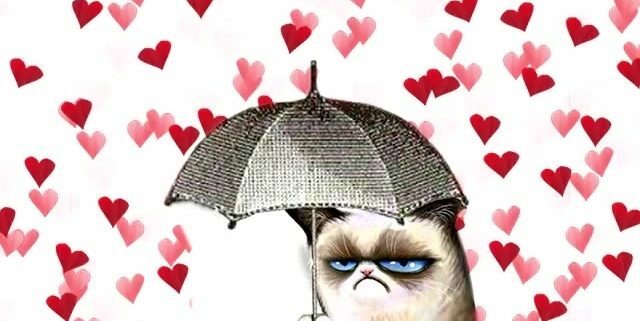 Pro-Valentine’s Day? 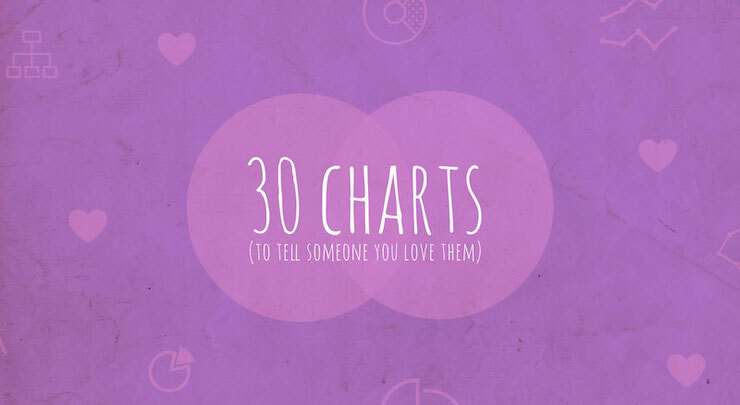 Edit the text and swap out the icons at the top with more traditionally romantic symbols. Hearts? Flowers? A robot with a beating heart? It’s up to you. Get more design tips and flyer examples in our roundup of 50+ templates. 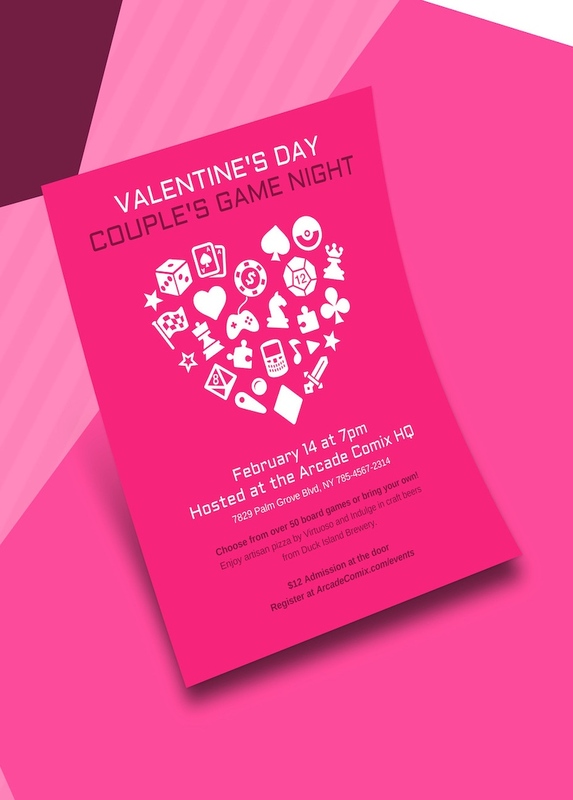 Sweet modern romance is the theme of this promotional Valentine’s Day flyer. It keeps the focus on what’s most important to the customer: how much cold hard cash they’re going to save. Include words like “limited time” or “once a year” to create the idea of scarcity. Be clear whether customers need to visit a place or a website to access the sale (or if they need to book an appointment). Include your store address, if applicable. 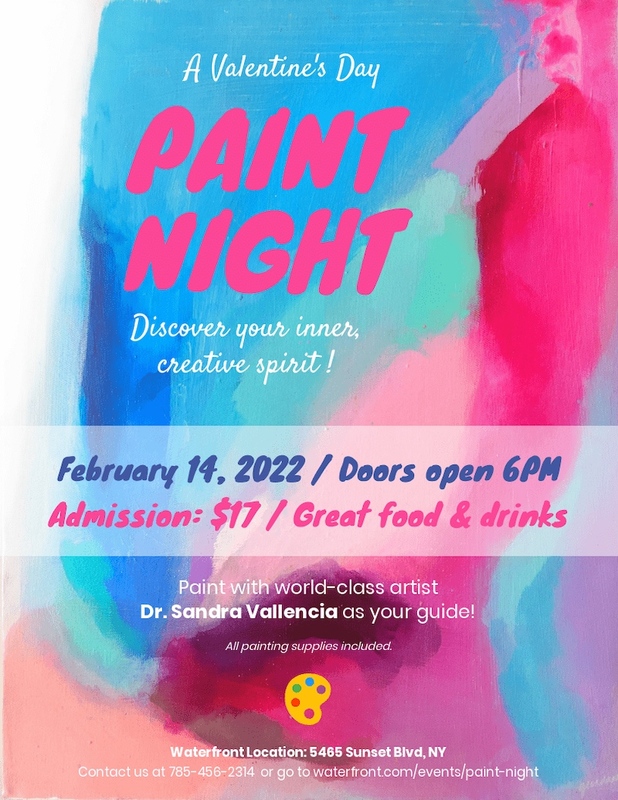 This Valentine’s Day flyer showcases one of 2019’s biggest graphic design trends: gradients. It also uses three different fonts to highlight different types of information. The script font adds a romantic touch to this otherwise futuristic-looking design. Click and select the text to change up the font, if you like. Venngage’s Brand Kit lets you import your fonts and logo from your website, so you can quickly brand your flyer (Business plan only). Just remember, don’t use too many fonts in one flyer. And make sure the fonts you do use are easy to read. If you choose a script font, make sure it’s legible. Again, make sure you tell customers where they can buy tickets or how to RSVP, whether that’s on Facebook, a dedicated event page, in person etc. 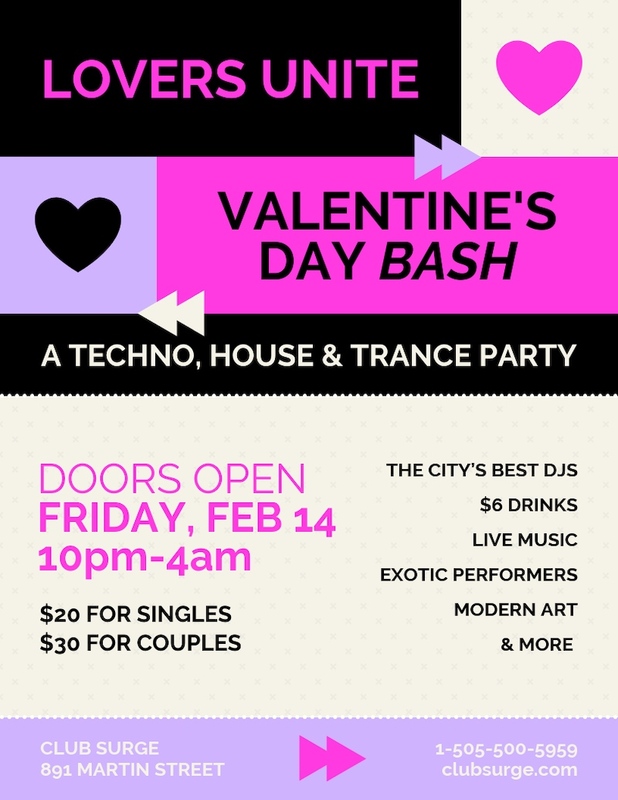 The party continues with this trance-themed Valentine’s Day poster. Use plain English and short sentences to sell your event. Bullet points work, too. This flyer template has a column on the bottom right where you can quickly and easily insert your big bash’s top selling points. The template’s bottom section makes it super simple to include all your contact information. The below example shows how you can customize your flyer’s colors. Again, you can pick colors from your Brand Kit to instantly brand your design (Business plan only). To change your flyer background, click the element you want to change. In the below example, it’s the “Valentine’s Day Bash” section. Then, click the color button in the top navigation bar. Select one of your brand colors, the template’s swatch colors or a custom color from the color wheel. An attention-grabbing headline is a key part of any effective flyer. 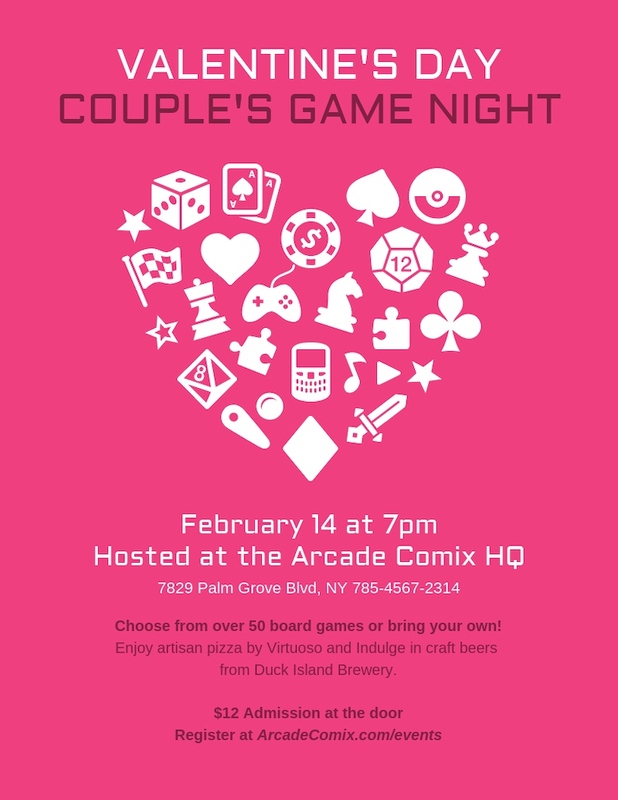 The flyer below combines a bold headline with an eye-catching collection of geeky icons in the shape of a heart. Or use words like “exclusive” or “one day only” to create a sense of urgency. 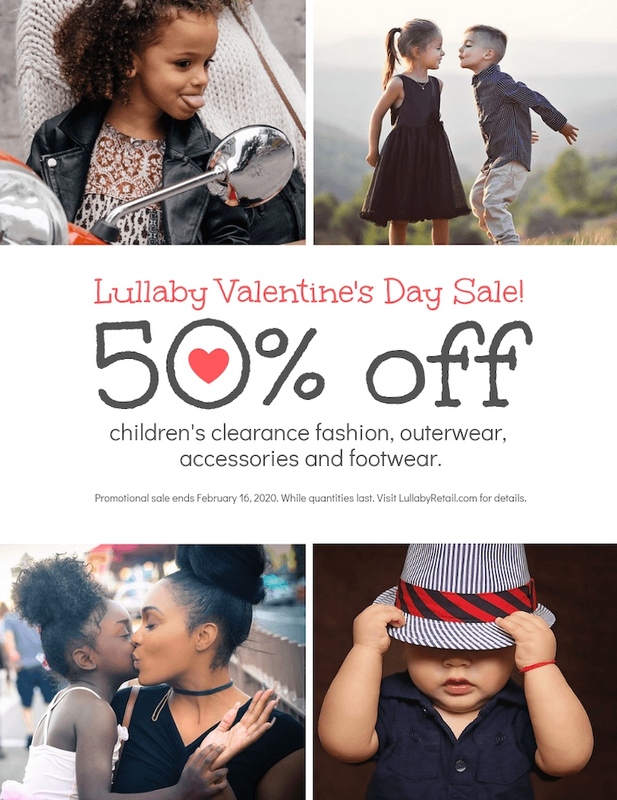 This adorable sale sign template shows how high-quality photography can instantly improve a flyer. Upload your own photos or incorporate stock photos from our library. 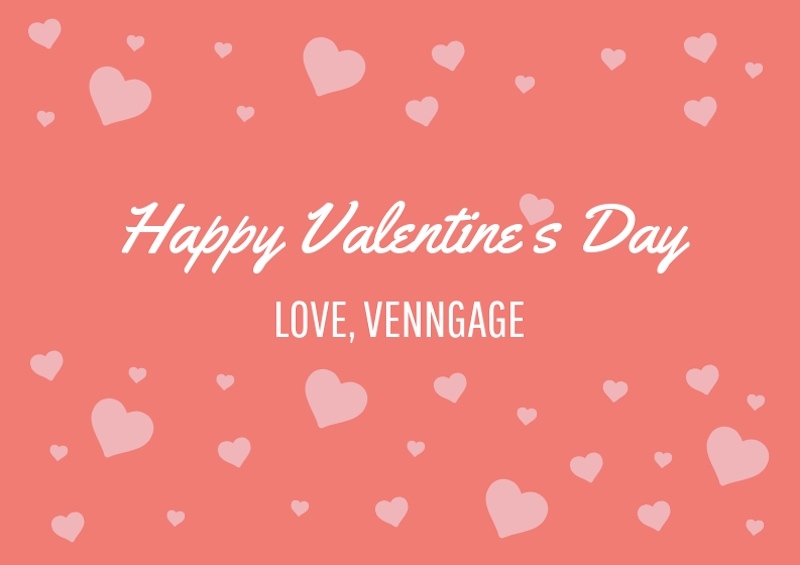 Venngage has partnered with Unsplash, the best source for beautiful, free stock photography. So you’ll have thousands of eye-catching options to choose from. If you choose to upload your own photos, build trust by including shots of the business owner or other employee. Have them demonstrate the product or appear in the company’s uniform. 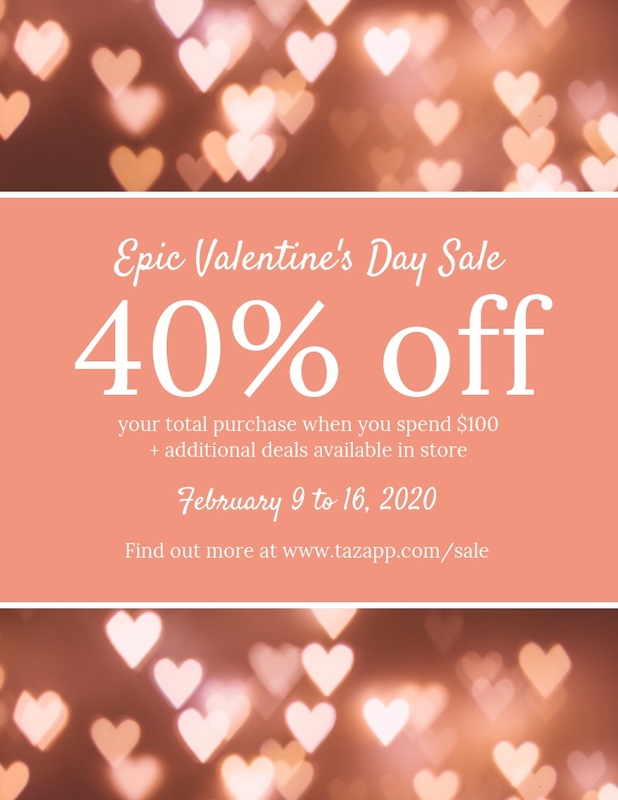 Valentine’s Day isn’t all about the hottest party or sale. Maybe you’re running a fundraiser or hosting a local event. This Valentine’s poster is a perfect way to get the word out. If you’re running a fundraiser, you may want to invest in higher quality gloss or matte stock to really make your colors and fonts pop. Low-quality paper screams “cheap!” Don’t let that be you. Of course, you can always cut costs by distributing your flyer online. Our post on promoting your business on social media will help you do this effectively. Valentine’s goodies? Yes please! 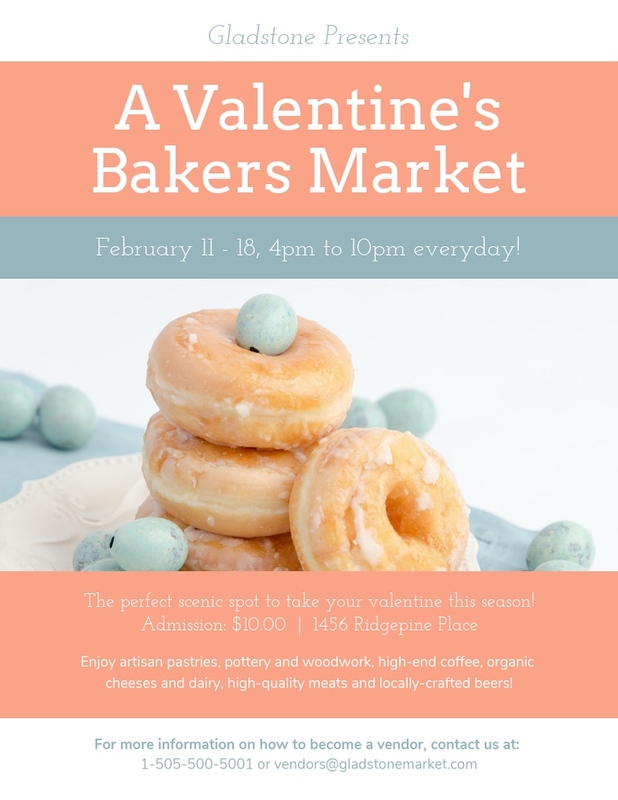 Swap in a quality shot of your product in this Valentine’s Day flyer, whether it’s a yummy edible or otherwise. Feel free to change the background colors. Just remember, the font color should contrast with the background—light fonts with dark backgrounds and vice versa. You could also try changing the call to action information text (location, admission details) to a different color to highlight it. 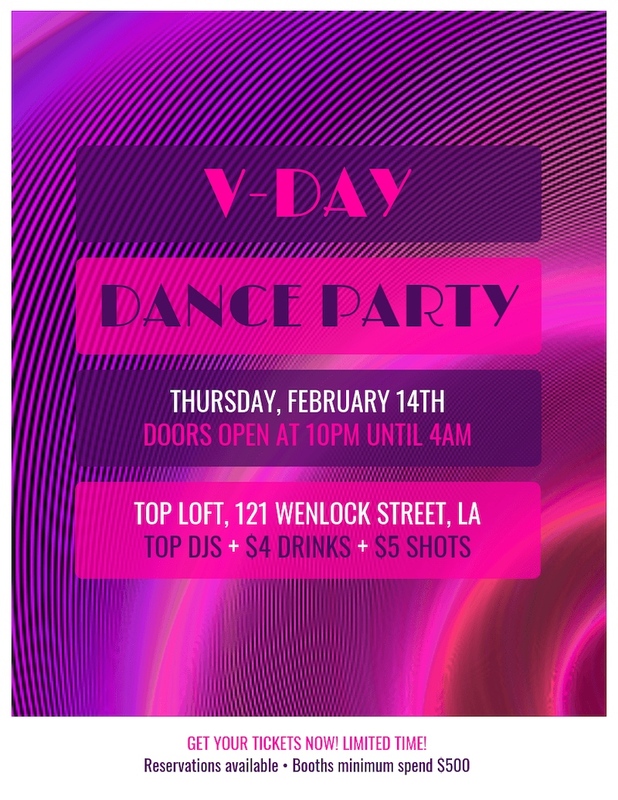 This bombastic Valentine’s Day flyer keeps the focus on two key selling points: cheap drinks and hot acts. When designing a flyer, think about what your potential audience wants. Exclusivity? A really great deal? VIP perks? A one-of-a-kind venue? Now make sure your flyer focuses on those points. 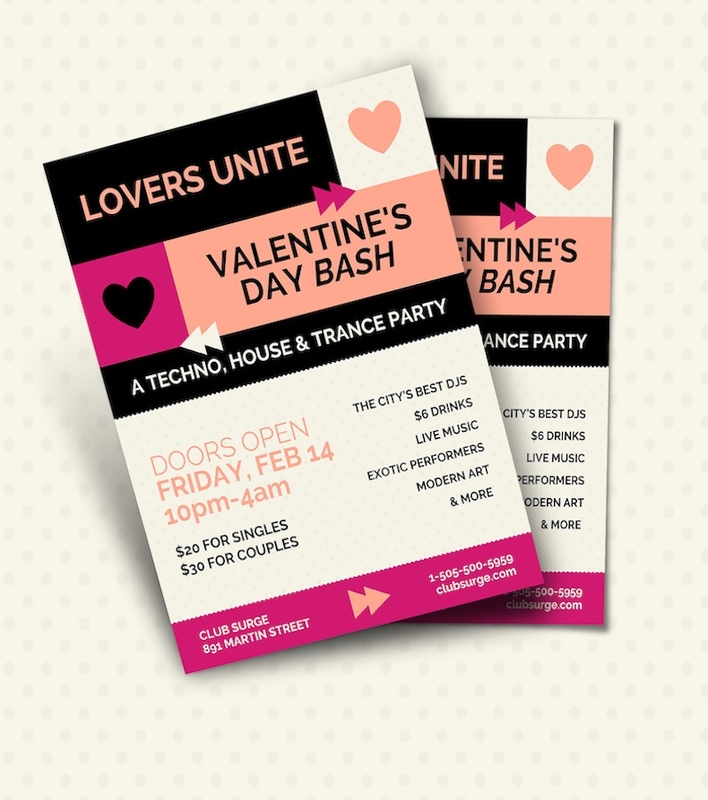 Your Valentine’s Day flyer template should be the same size you want to print it. Our article on how to change the page size will help you do this. Venngage’s editor measures size in pixels, so decide on a size in inches and then use this free online pixel converter to convert inches to pixels. Remember, most printers won’t print to the edge of the page; they’ll shrink the image slightly instead. You may need to cut off the white edges by hand. Now choose “HD PNG” or “PDF” to make sure you’re getting a high-resolution image. When you print your flyer, it won’t be blurry. 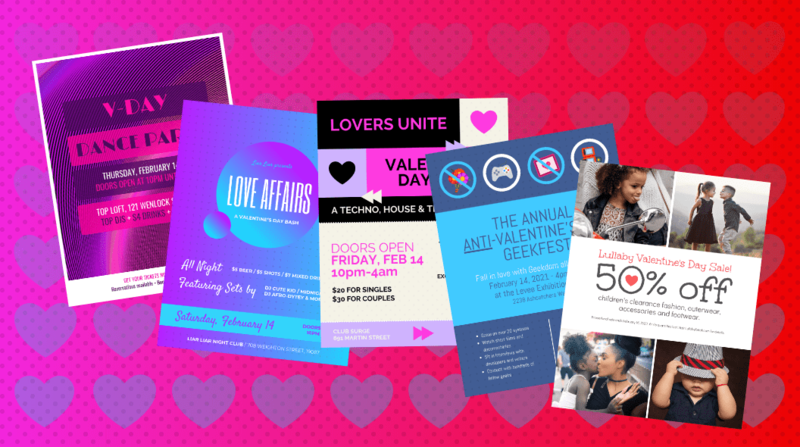 Which Valentine’s Day flyer template do you plan on using? Tell us in the comments below!